At the beginning of the Jeffersonian era, only two states (Vermont and Kentucky) had established universal white male suffrage by abolishing property requirements. By the end of the period, more than half of the states had followed suit, including virtually all of the states in the Old Northwest. States then also moved on to allowing popular votes for presidential elections, canvassing voters in a more modern style. 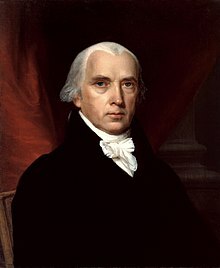 Jefferson's party, known today as the Democratic-Republican Party, was then in full control of the apparatus of government—from the state legislature and city hall to the White House. The Federalist Party, especially its leader Alexander Hamilton, was the arch-foe because of its acceptance of aristocracy and British methods. Louisiana and the Mississippi River were critical to American national interests. Control by Spain was tolerable—control by France was unacceptable. See Louisiana Purchase. A standing army and navy are dangerous to liberty and should be avoided—much better was to use economic coercion such as the embargo. See Embargo Act of 1807. The militia was adequate to defend the nation. 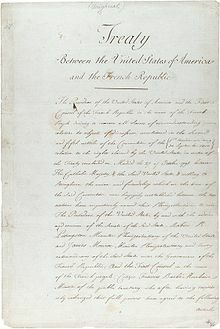 During the Revolutionary War previously, a national conflict, in this case the War of 1812, required the creation of a national army for the duration of international hostilities. Jefferson's thoughts on limited government were influenced by the 17th century English political philosopher John Locke (pictured). After initial skepticism, Jefferson supported the ratification of the United States Constitution and especially supported its stress on checks and balances. The ratification of the United States Bill of Rights, especially the First Amendment, gave Jefferson even greater confidence in the document. Jeffersonians favored a strict construction interpretation of federal government powers described in Article I of the Constitution. For example, Jefferson once wrote a letter to Charles Willson Peale explaining that although a Smithsonian-style national museum would be a wonderful resource, he could not support the use of federal funds to construct and maintain such a project. The "strict constructionism" of today is a remote descendant of Jefferson's views. Prominent spokesmen for Jeffersonian principles included Madison, Albert Gallatin, John Randolph of Roanoke, Nathaniel Macon, John Taylor of Caroline  and James Monroe, as well as John C. Calhoun, John Quincy Adams and Henry Clay (with the last three taking new paths after 1828). ^ William S. Dietrich (2008). In the Shadow of the Rising Sun: The Political Roots of American Economic Decline. Penn State Press. p. 165. ^ Fitzgerald, Michael S. (1996). "Rejecting Calhoun's Expansible Army Plan: the Army Reduction Act of 1821". War in History. 3 (2): 161–85. doi: 10.1177/096834459600300202. ^ Robert W. Tucker and David C. Hendrickson, Empire of Liberty: The Statecraft of Thomas Jefferson (1990). ^ The Lewis & Clark, Fort Mandan Foundation. "Show 1048 – Redistribution." The Thomas Jefferson Hour. Prairie Public Radio: 27 October 2013. Web. 30 October 2013. ^ White, Richard (1991). "It's your misfortune and none of my own" : a new history of the American West. University of Oklahoma Press. p. 63. ISBN 0-8061-2366-4. ^ Jenkinson. "#1247 On My Doorstep." Podcast. The Thomas Jefferson Hour. The Thomas Jefferson Hour, 15 August 2017. Web. 17 August 2017. ^ Thomas Jefferson (1900). John P. Foley (ed.). 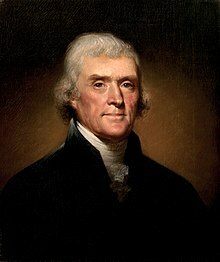 The Jeffersonian Cyclopedia: A Comprehensive Collection Of The Views Of Thomas Jefferson Classified And Arranged In Alphabetical Order Under Nine Thousand Titles Relating To Government, Politics, Law, Education, Political Economy, Finance, Science, Art, Literature, Religious Freedom, Morals, Etc. Funk & Wagnalls company. p. 323. Retrieved 26 March 2010. ^ Jefferson, "The Jeffersonian cyclopedia." These revenues will be levied entirely on the rich . ... The Rich alone use imported article, and on these alone the whole taxes of the General Government are levied. The poor man ... pays not a farthing of tax to the General Government, but on his salt; and should we go into that manufacture also, as is probable, he will pay nothing. ^ a b Jenkinson. "#1253 Second Term." Podcast. The Thomas Jefferson Hour. The Thomas Jefferson Hour, 26 September 2017. Web. 26 August 2017. ^ Robertson, Andrew W. (Summer 2013). "Afterword: Reconceptualizing Jeffersonian Democracy". Journal of the Early Republic. 33 (2): 317–334. doi: 10.1353/jer.2013.0023. ^ Carson, David A. (April 1986). 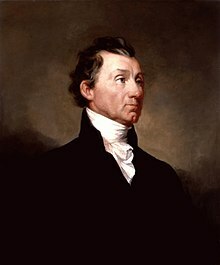 "That Ground Called Quiddism: John Randolph's War with the Jefferson Administration". Journal of American Studies. 20 (1): 71–92. JSTOR 27554706. ^ Sean Wilentz, "Book Reviews", Journal of American History Sept. 2010 v. 97# 2 p. 476. Wilentz, Sean. "Jeffersonian democracy and the origins of political antislavery in the United States: The Missouri crisis revisited." Journal of the Historical Society 4#3 (2004): pp. 375–401. ----. Empire of Liberty: A History of the Early Republic, 1789-1815. Oxford University Press, 2009.